Olivia Midgley spoke to the Trust’s rural enterprises director Patrick Begg and head of food and farming Rob Macklin to find out their priorities for the next decade. The National Trust recently came in for a raft of criticism after it said decades of ‘unsustainable’ land management had done extensive damage to Britain’s countryside. 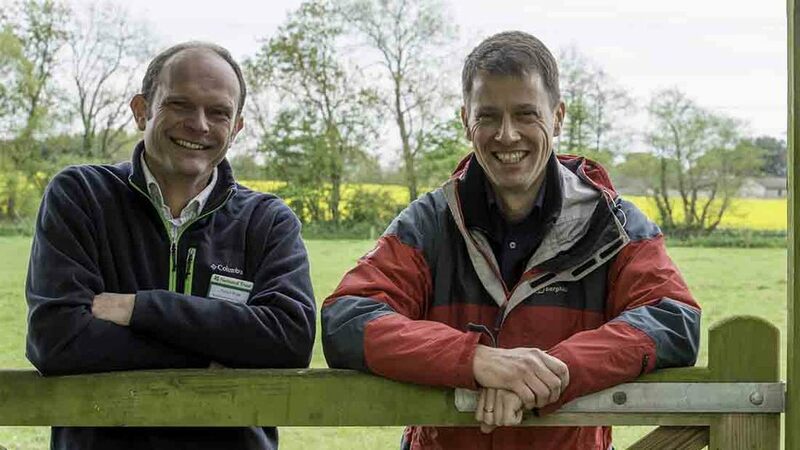 Many in the industry accused the Trust of ‘farmer-bashing’ – however, the charity has insisted it is not an ’anti-farming’ organisation and wants to work alongside farmers to improve the country’s landscape. The Trust’s 10-year strategy came in for some criticism from the farming industry. Do you think this was justified? Patrick: It was a shame it came out or looked like we were anti-farming, because that is not the case. The Trust is avidly pro good farming and this is what it was all about really – fixing our focus on how we work with our tenants and our land to do something good. There are loads of our tenants already doing it and we want to build on the best of that. There are places where we know we have not got it right and this will be partly our fault and it will sometimes be things the tenants have not been doing right. There are some worrying signs around showing some of our land is not in as good heart as it should be. At the strategy launch, Dame Helen Ghosh criticised past Government subsidies which led to farmers putting short-term production ahead of long-term health of the land and natural environment. Do you agree? Rob: Intensive agriculture leading to habitat depletion is nothing new. This has been scientifically evaluated. There were Government-subsidised hedge removal schemes in the 1970s which wiped out a lot of habitat. This improved arable efficiency, but you can have too much of a good thing. Taking out too much habitat has had an indelible impression. We now have great opportunities to create new habitat without adversely affecting farm viability. Are many farmers already doing this? Rob: We know a lot of good stuff has been done, but we have to recognise we can all do a lot more. The Campaign for the Farmed Environment and Linking Environment and Farming are doing some great stuff, so we all have to work together. There is no one-size-fits-all solution, it is about looking at what the best fit is. What are you expecting from farmers as part of this strategy? Rob: Farmers need to be aware of where there are issues and take corrective actions. We have instances where we have inappropriate cropping on challenging slopes with vulnerable soil types which does not make any sense. It is a question of everyone taking a long, hard look at what they are doing and asking if we are doing high risk activities on really vulnerable land, should we have a rethink about this and either change the activity or do it elsewhere? What will the National Trust do to address its relationships with tenants? Patrick: In some areas, we are hugely committed to establishing a relationship because we have been quiet. In other places, we are rebuilding a relationship because we have fallen out. And in others, it will be building on the great relationship we already have. We know we have got to focus on this because we have had our eye on other things, such as the visitor business. The strategy now is focusing on our land and those 250,000 hectares (625,000 acres). The Trust has been accused in the past of having a short-termist approach to leases. Do you think this needs to change? Patrick: Because we have a big responsibility for the land we manage, we need to define ways to invest in longevity. But like a marriage, if things go wrong there has to be a way on both sides to call it quits and not be locked into something which might ultimately be damaging. The Trust routinely starts at 10-year Farm Business Tenancies (FBTs) and we have a lot of 20-year FBTs on top of that. Farmers tell us of hikes in rent with little investment in return. What would you say to those tenants? Patrick: The Trust has always been driven by outcomes rather than rent. We do not chase rent. This is not why we own land as it is not as a cash cow. We own land in order to deliver the right things from it. We know from benchmarking we are about 25 per cent, on average, behind market rent for our farms. And to those who say they are harassed by agents? Patrick: It would not be far-fetched to think of us starting to move towards being able to do our rent reviews in house. Face-to-face, time around the table and getting first name relationships which lead to a better understanding of what is going on will probably get you quite far. I think if we move within the next three years, it would be a fair target. Do you think the Trust invests enough in its farms? Patrick: We do have to make some ground up. Where there are good enterprises we should be doing more. We are putting aside £90 million over the next 10 years for land management. Does the Trust want tenants to survive by the skin of their teeth and not earn real cash? Patrick: No, you have to be able to make a good living. It is fundamental. Otherwise why would you want to do it? We should be looking at all times to see what is viable. Farmers have raised concerns about the Trust placing unproven tenants in some areas which have done more harm than good. What are you thoughts on this? Rob: We have to take a risk and sometimes things do not work. It is one of the consequences. We do a pretty thorough tender process and cast the new far and wide to get people who have a variety of skills. We are right behind the Fresh Start initiative, so a lot of our staff spend time helping mentor potential new entrants. What changes would you like to see in the Trust in the next 10 years? Patrick: I am keen we investigate more into our role in providing starter units and we are already testing the water with this in Wales with our farm scholarship. The vision is for all our tenants to feel like it is an advantage to be a tenant of the National Trust. You will know we have succeeded when we are somewhere near that, rather than people being sceptical about our motives, sceptical about our ability to respond and seeing us as slow or cautious. Let us not pretend we do not want more nature, as 50 years on we want to be looking at a richer countryside with hedgerows buzzing with life, water and soil quality – and we can measure these things. We will take some benchmarks and set ourselves some targets. We have not been good enough about telling farmers what we want. We need to be better at setting the vision of what we want and then be good at accommodating the solutions.